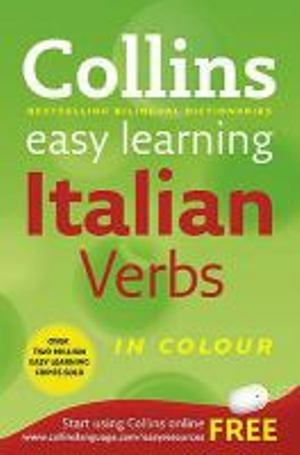 Designed to accompany and complement the dictionary and grammar in the widely acclaimed Collins Easy Learning range, Collins Easy Learning Italian Verbs offers beginners a clear and easy-to-understand guide to Italian verbs. The main section of the book consists of 120 fully conjugated verbs, regular and irregular. Each is self-contained in a double-page spread showing all the major tenses, clearly set out with pronouns. Major constructions and idiomatic phrases are given for most verb models. An alphabetical index lists over 1000 widely used verbs, and each one cross-refers the user to its basic model in the main verb tables. / Collins Easy Learning Italian Verbs shows all the major tenses of the most important verbs in Italian in full. / Hundreds of examples of real Italian show exactly how each verb is actually used. / Clear, colour layout ensures that you find the information you need quickly and easily. Other titles available in the Collins Easy Learning Italian range are: Collins Easy Learning Italian Dictionary, Collins Easy Learning Italian Grammar and Collins Easy Learning Italian Conversation.